SLink has just released these new Tiger Heels and they’re absolutely gorgeous! I think Siddean has updated the toes cos they so cute and realistic. I’ve been waiting for some new Spring/Summer shoes, and these arrived just in time! 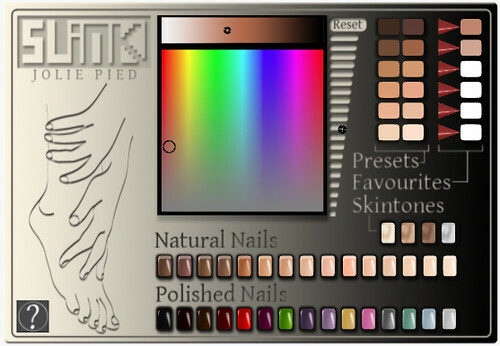 The SLink Tiger Heels also comes with an upgraded HUD to change nail colors, skin colors, resize, and save your skin presets! There’s also White (not shown here). You thought Truth wouldn’t release any hair this week, did you?? Truth is on vacation (Aus -> USA) but has managed to release two hairstyles. I’m wearing Sienna, and Sienna 2 in Cocoa texture. I thought, when I received the flyer, that the toes were so fantastic. They are super realistic.